I'm really not sure what attracted me to this building. 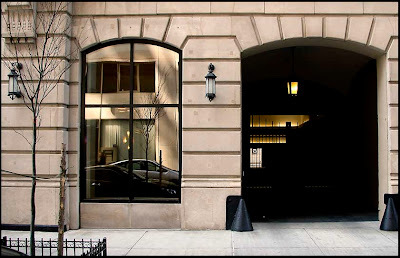 After 23 years I have no idea if I was passing the handsome facade on West 64th Street, or if I was wandering around the plaza at Lincoln Center, a block and a half to the west, when I spotted its most striking feature. 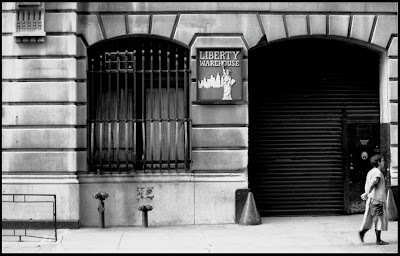 That feature of the Liberty Warehouse, however, wasn't the solid stone facing, or its keystone arches. What made this century-old building unique was the 37-foot tall replica of the Statue of Liberty on the roof, eight stories above the ground. William H. Flattau built the warehouse and had the statue crafted in Akron, Ohio, from where it traveled by flatbed railroad car to the west side of Manhattan in 1902. I passed the building in September of 1985 during an afternoon wandering the west side, shooting the Ansonia Hotel and the Dakota apartments. 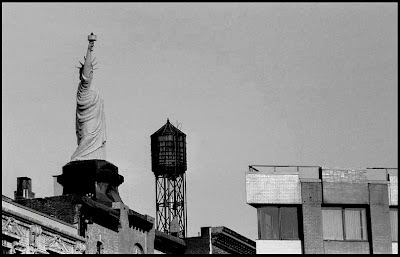 She stood above west 64th street until 2002, when she was removed and stored behind the Brooklyn Museum where she underwent extensive restoration (including the removal of the lead-based paint covering it) and installed at the museum's rear entrance during the summer of 2006. The warehouse itself was gutted, several stories were added to the building, and it reopened as residential condominiums. As we see in the 2008 photo, the loading bay now leads to a courtyard, new lanterns have been added and the standpipes relocated. The corner bumpers seem to be the originals, so perhaps vehicles still pass through the portal. I tried my best to recreate newer picture of the statue, but was hampered by being so close to my subject. 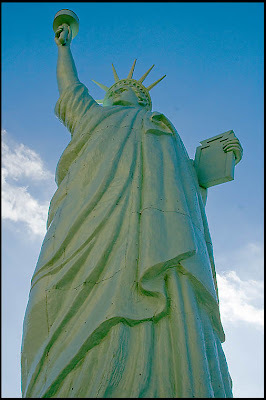 The first picture was made with a 200mm lens while I was standing on the sidewalk eighty feet or so below the statue; optical foreshortening in the telephoto lens compresses the image, giving it a chunky stature overall. For the second shot I had to lie on the ground with short zoom set at 22mm. I also had the disadvantage of the sun behind my subject, but I like the band of clouds. 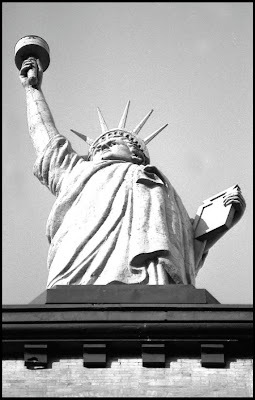 For another current picture of this Liberty, and to see some other pictures from the Brooklyn Museum's urban sculpture garden, visit this page from the Talking Pictures site. The light in the reflection on the window of the Liberty Warehouse has a wonderful burnished quality; the colors are great.